Dror Sinai is an international performer, educator, and performing artist, as well as the Founder of RHYTHM FUSION, Inc. in Santa Cruz, California. In 2002, he received the Gail Rich award for supporting the arts, and is a founding member of the World Music Committee for the Percussive Arts Society. 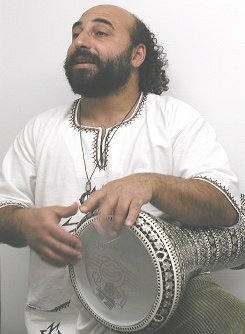 Dror has presented lectures, clinics, and workshops to diverse audiences, including Universities, schools, community gatherings, adults and children, and has taught both professionals and amateurs; he has been a featured instructor for Spectra of the Santa Cruz Arts Council, and at clinics during PASIC (Percussive Arts Society International Convention). Has been working for world peace as a way of life and taught and performed on the “Peace Boat” as well as at The World Sacred Music Festival, Fes, Morocco ’09 . Now scheduling. Please see the reverse side for a list of lectures, clinics, workshops, and performances. Contact Rhythm Fusion for fees and available dates. Educational, Social, entertaining and community building retreats. I love your new site, Dror!